On my actual b-day I went to a networking event where I met a couple of people, including a very cool person who I met up with again at another event and hope to hang out with when I'm back in NY. I also went to Of Montreal, which was fantastic and included several Of Montreal'esque antics.. including 2 fighting pigs (fake) that got spanked by Susan Sarandon (real). Ask me about it in person if you're interested in hearing about it. So another thing on my to-do list was to go on a talk show. I will admit here that I love TV. I don't often make time to watch television anymore & rarely turn on the tv at all... nowadays I typically get my fix by getting obsessed with a series and then watching it via rental or online in a ridiculously short time frame. The last few series where I have done this are: The Office, Battlestar Gallactica, Mad Men, Lost, Dexter & 30 Rock. I abandoned Weeds and True Blood... they didn't really hold my interest. I have the Wire queued up. This behavior is not very unique, as most people I know do this. However the exception I make is the Colbert Report, I will regularly stay up to watch his show and to say that I'm a huge fan is an understatement. He's awesome, and I have a bit of a man-crush on him. 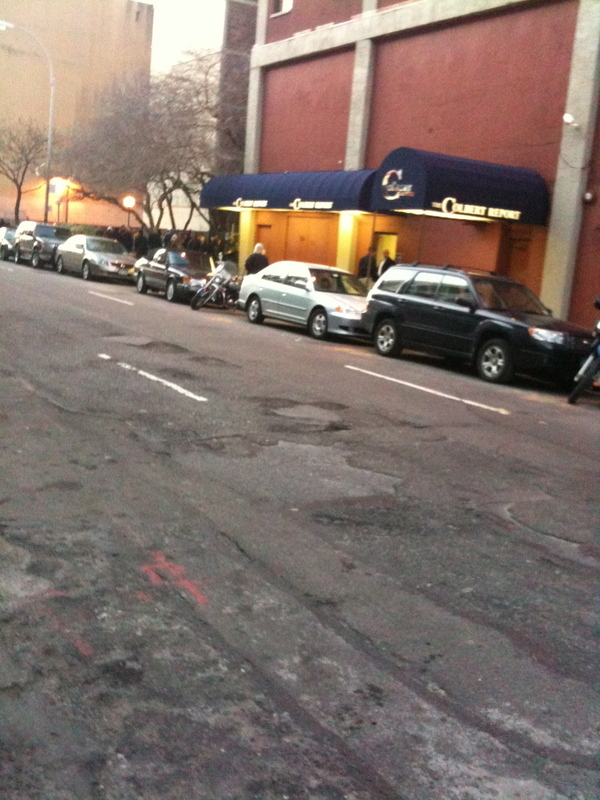 When I went to NY, I did a bit of research to see what you needed to do to get tickets for the show. Much like SNL, the Daily Show, Letterman and Late Night - tickets to the Colbert Report were given out months in advance and the few seats available were given out on a standby basis which involved waking up early and standing in line all day. I thought I would have plenty of time to fit in a day of line-standing but it turns out that 10 weeks in NY can go by pretty quick. In a last ditch effort, I went online again to see if there was another way. It turns out there is. In many cases, the VIP tickets that get handed out months before become available, because traveling plans get changed or something comes up, etc. VIP tickets are non-transferable (to prevent a black market for the free tickets), so when that happens the Daily Show and Colbert Report post the ticket openings back on their web site. Because of their popularity, normally they go extremely fast (4-5 mins). The good news is that some guy made a twitter feed that alerts its followers when those tickets become available. On Jan 27th, I had tickets for that night within a couple of hours of following the twitter feed. If you are in NY and want to see Colbert or Jon Stewart... follow @dailytix. then he sat down on the ground in front of the audience and started singing Kumbaya. The audience joined in and I got another blurry pic, but his head is barely visible at the front center of the audience.